COLORADO SPRINGS, Colo. — USA Triathlon today announced that decorated U.S. Olympic wrestler Matt Ghaffari will serve as a keynote speaker at the USA Triathlon Hall of Fame Banquet, set for Aug. 9 in Cleveland. The event will be held in conjunction with the USA Triathlon Age Group National Championships, taking place at Cleveland’s Edgewater Park from Aug. 11-12. Ghaffari, a 1992 U.S. Olympian, 1996 Olympic silver medalist and three-time World Championship medalist, will speak about what it means to be successful at the highest levels of amateur and Olympic sport. Four multisport legends make up the ninth induction class of the USA Triathlon Hall of Fame to be honored at the banquet: four-time U.S. Olympian Hunter Kemper, age-group multisport standouts Donna Smyers and James Ward (posthumous), and Mike Reilly, the “Voice of IRONMAN.” For more about each of the inductees, click here. Born in Tehran, Iran, Ghaffari immigrated to the United States as a teenager and competed for his high school wrestling team in New Jersey. He earned an impressive 56-11-2 record during his collegiate career at Cleveland State University, setting the school record for pins as a senior. Ghaffari, who still calls Cleveland home, went on to a storied amateur wrestling career. He is best known for his silver-medal performance at the 1996 Olympic Games in Atlanta, where he took Russia’s seemingly invincible superstar Aleksandr Karelin into overtime in the gold-medal match before falling, 1-0. He also represented the U.S. at the 1992 Olympic Games in Barcelona. Ghaffari is the only U.S. Greco-Roman wrestler in history to earn a total of four World Championship and Olympic medals. He is a four-time World Cup champion and nine-time Pan-American Championships gold medalist, both USA Wrestling records. Ghaffari is also a seven-time USA Wrestling National Champion, two-time Pan American Games gold medalist, and was twice named the U.S. Olympic Committee’s Greco-Roman Athlete of the Year. He is a Distinguished Member of the National Wrestling Hall of Fame. “I am thrilled and honored to be part of recognizing these dedicated athletes who have accomplished outstanding achievements,” Ghaffari said. 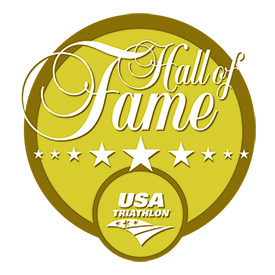 The USA Triathlon Hall of Fame induction ceremony and banquet will be held at Windows on the River in Cleveland on Aug. 9 starting at 5:30 p.m. ET. The event is open to the public, and individual tickets are available for purchase for $75 at usatriathlon.org/hof. A $10 discount on ticket prices for 2018 USA Triathlon Age Group National Championships participants has been extended through July 31. Instructions for how to register with the discount will be communicated in upcoming pre-race newsletters, or those interested may email Ellis Davis at ellis.davis@usatriathlon.org. Corporate or sponsor tables (10 seats) are also available for $1,000, which includes a $250 donation to the USA Triathlon Foundation. The purchase of a corporate or sponsor table also includes the company’s logo featured in the event program and registration platform, as well as an emcee mention during the ceremony. Those interested in purchasing a table may contact Ellis Davis at ellis.davis@usatriathlon.org. Tickets will be available until Wednesday, Aug. 1, or until the 250-attendee limit is reached. For more information about the USA Triathlon Hall of Fame, visit usatriathlon.org/hof.